I am glad that I don't live on selling tea or sell tea at all. When I choose tea just for myself I feel free. There are no worries. Usually when I got samples it is wider selection of different teas, different origins, years, prices. It is fun to get to know them and quite easy to choose what to buy and what to pass. Recently I got three Mao cha to try. All from spring, last year harvest, Yiwu villages. Thanks to Eugene and Belle of TeaUrchin, I got a chance to try to taste leaves before pressing to cakes. Just three, already well selected, teas and how difficult is to choose the one. How it will change the pressing? And how few years of storage? Thanks to all those sincere and capable tea merchants for doing this job for us. I have leaves for from Man Zhuan, Luo Shui Dong and Gao Shan Zhai. Reading several articels, and especially talking to friends, who have visited the area, I know how complicated is to buy good maocha in such famous villages. Stories about rich people buying whatever with label LuoShuiDong on it are not just myths. Prices are growing much faster then skills of farmers, sometime faster then leaves themselves. Cakes from Tea Urchin are not cheap either but I believe that they have ways how to find the real stuff. Each bag have enough leaves for several tea sessions. I started with side by side testing. It is good way for comparing smell and look of leaves, both dry and wet. It also help to compare tastes and aromas how it goes through brews. It is very hard to draw a comparison of aftertastes this way and I am even not talking about Qi. All leaves are wonderful. 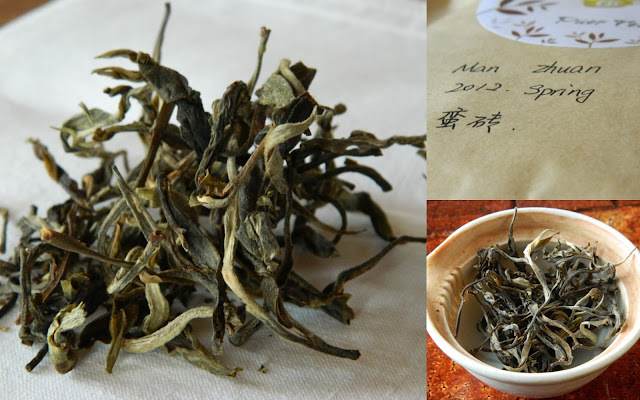 Hairy, green-gray, long and tight.Man Zuan looks to have a bit smaller leaves but it can be just the batch. Smell of dry leaves is also pleasant. Smell of LuoShuiDong (LSD) is strongest but of similar origins. 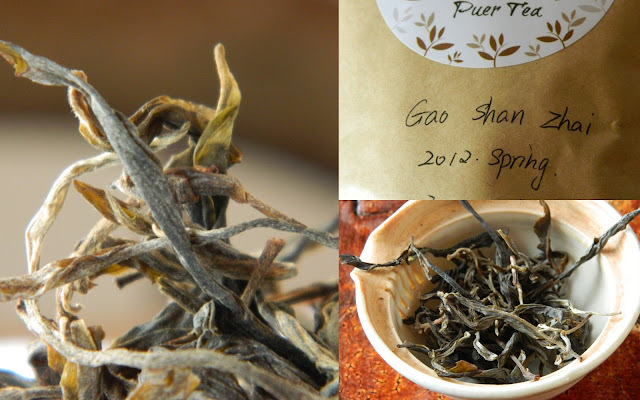 Same apply to wet leaves, just in ManZhuan I find light smoky notes. GanShanZhai (GSZ) stays clear and light. All soups are naturally yellow-light green. I used 3g of tea to each of my 70ml shiboridashi and all brews are quite strong. In color, fragrances as well as taste the LSD is the strongest one. And it stays like this for all brews I make. The Man Zhuan is sharper, but the smokiness is getting stronger (still rather light). I am wondering if it is good thing for cakes and storage or if it even matter. To see some bitterness of live I make the third brew stronger. And here it is! Fresh leaves from old threes. LSD is, again, the most bitter and the strongest one. The GSZ stays still and clear, and I am starting to fall in love with it. When I take a look at spend leaves all looks nicely green. In every of them I find some partly oxidized leaves, two or three of them. I did not find any sing of "reddening" in taste. Some people say it is fault of Puer some that it is quite natural and it is petty to pay attention to it. I don't know. If you are asking, which of those three MaoCha is winner then, for now, it will be Gao Shan Zhai. But I will try them also separately to enjoy aftertaste and energy, the nature of each of them. Look forward to it. Those leaves look beautiful, as do your cups. Did you make these yourself? Please have a look at our website www.lulin-teas.com for quality loose tea. 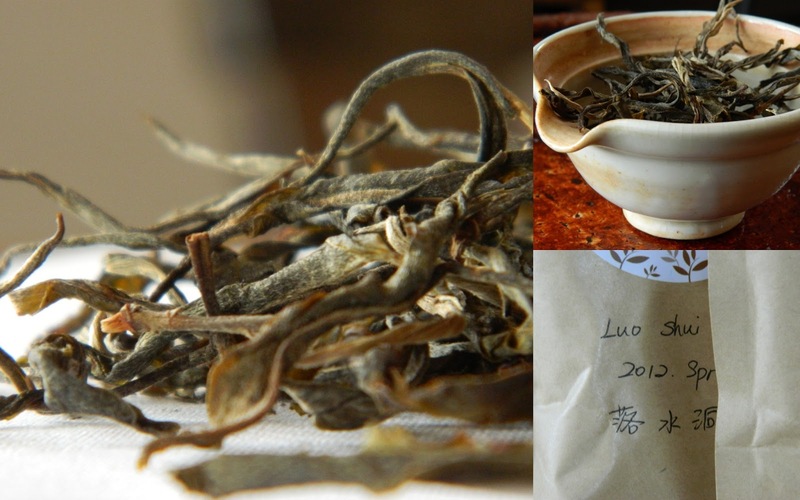 I have found I prefer maocha over compressed leaf when it is very young. Much more green and refreshing taste. But prefer the compressed when aged. Did you taste the cakes also? You are probably right...I had some great aged maocha but we can just guess how they would be if pressed. I havenť try those teas as cakes yet. It is a pleasure to read your blog. I will look forward to all of your writing and I am considering buying a teapot. Dear Charles, Thank you for your support! The information provided is really appreciating about tea leaves and the benefit of teas and what we should choose that's matter?And it is true that leaves nurturing at the zenith of mound are very much beneficial not only for health but also it help to make your taste even better about the beverages. Gao Shan Zhai one of category of mao cha is very beneficial for health issues among all and really it is very very tasty.